(CNN) – Days before the release of her new book, Sen. Elizabeth Warren reiterated that she's not angling for a White House bid. "I'm not running for president," the Massachusetts Democrat said in an interview that aired Sunday on CBS's "Sunday Morning." Pressed again, she stood firm: "I'm not running for president. You can ask it lots of different ways." The timing of her book's release on Tuesday has drawn parallels to President Barack Obama, who also published a title two years into his first Senate term back in 2006. He announced his presidential campaign less than a year later. 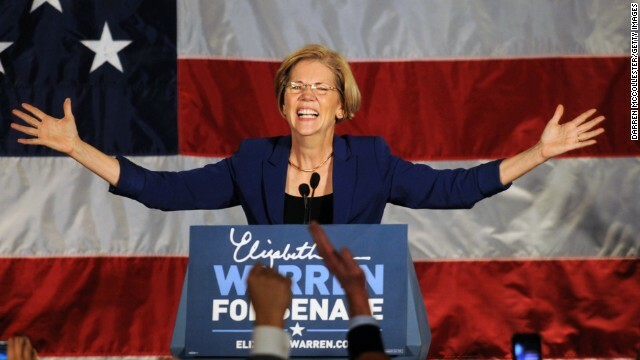 Warren, who was elected to the Senate in 2012, has become the face of the progressive movement. While former Secretary of State Hillary Clinton is the overwhelming favorite in public opinion polls for the 2016 Democratic nomination, Warren frequently comes in at a distant second or third place. FULL STORY. We want you to weigh in: Do you want Elizabeth Warren to run for President in 2016? Why should she run? Hillary is going to win. The GOP should spend its money and efforts to win governor, US senator, and US representative elections. Pleeze – not another crazy liberal woman!! Her candidacy could be good for the Democrats. No matter how extreme left the other candidates might be, they will appear moderate in comparison. Please run. I would fully support her run for demoncratic nominee. I would support her candidacy if she got the support from the Cherokee Nation. Since she used to be part of a minority. She cannot run. In any other state besides MA her candidacy for the Senate would have been a joke. The lady claims to be an American Indian. She has blonde hair and blue eyes. She is a liar. Problem is in MA the Dem always wins except for the one case of Scott Brown. That was more the Dem candidate being so bad the Dem machine could not save her. She would be a laughing stock in a national election. Not commenting about Warren in particular, but your idea that if you are light skinned with light hair you cannot be a native american is simply false. Most tribes recognize those of partial native blood as still being natives. Some are at 1/2 or 1/4th... others as small as 1/32nd. Even 1/2 native blood people can have their dominant features come from the non-native side. There are people who are 1/32nd native who look like they are 100%... and their are blond haired, blue eyed, light skinned natives who are 50% native american by blood. Genetics is a tricky thing. You can claim Warren has no right to say she's of native american descent... but you can't say "just look at her" as the reason for that claim (as Scott Brown did). My son plays with a little girl with white skin and blonde curly hair... and both of her (natural) parents are black. You have to get past looking at how someone looks to make a judgement on their background. Yes she should run. We all need to be lectured & told what to think. If she wants to run, then she should by all means. But being president has to be something you want and frankly she's never seemed all that interested in it to me. It feels like she found a relatively safe senate seat where she won't have to campaign that hard to be re-elected and she's going to try to change as much as she can from the inside without becoming a slave to the whole fundraising/re-election cycle. She comes across as a reformer, not a politician. And frankly you aren't going to become president unless you ARE a politician. Elizebeth Warren real Native American. Member of PawneephonyChicktaww Tribe. We have every other canidate run for president. Now need Indian run. Geronimo! The GOP Prayer/Mantra/Solution: Dear God...With your loving kindness, help us to turn all the Old, Sick, Poor, Non-white, Non-christian, Female, and Gay people into slaves. Then, with your guidance and compassion, we will whip them until they are Young, Healthy, Rich, White, Christian, Male, and Straight. Or until they are dead. God...Grant us the knowledge to then turn them into Soylent Green to feed the military during the next "unfunded/off-the-books" war. God...Give us the strength during our speeches to repeatedly yell........TAX CUTS FOR THE RICH!! !...........and........GET RID OF SS AND MEDICARE!!! Your little post is not remotely funny, Liz. But that's not surprising since a necessary element of humor is a little bit of truth. In all seriousness, your pray should be for a Republican president; otherwise, Clinton is likely to get us into World War III, that is if Obama and Kerry don't beat her to the punch. And you can be certain, that war will not be "off the books." @Algore – You voted for Palin didn't you. Read the Ryan budget to see what the GOP want to do with the Old, Sick, and Poor people.